Produktinformationen "Billie Holiday - Music For Torching With Billie Holiday LP+CD (Vinyl / LP)"
1955's Music for Torching is an album of "torch songs", meaning melancholic songs of unrequited love... and no one does melancholy better than Billie Holiday, especially when she has musicians of the caliber of Benny "King" Carter and Harry "Sweets" Edison playing behind her. During the years leading up to her untimely death in 1959, Holiday was as big of a star as she'd ever been, playing to sold out audiences at Carnegie Hall, releasing her autobiography, and recording prolifically for Verve. VINYL FORMAT. Comes with a CD of the album. 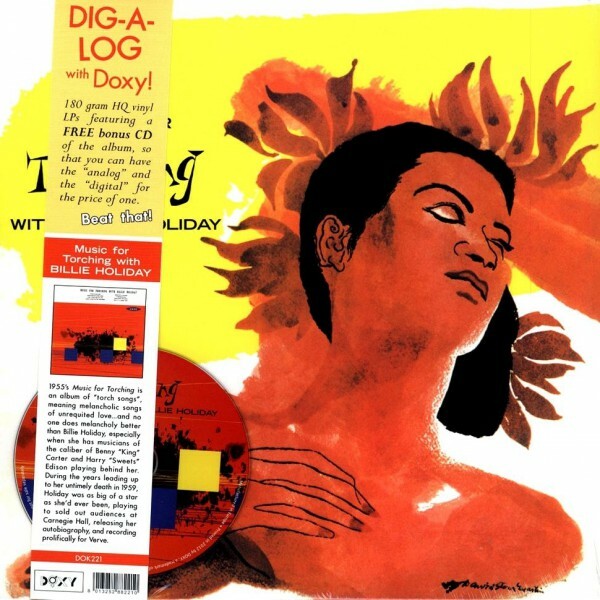 Like no other singer Billie Holiday revived the most famous songs of the American 30s and 40s show business era The composers of these recordings in 1955 Los Angeles for the Norman Granz Clef label are from the second rank of musical and songwriters apart from Duke Ellington The musicians came from the West Coast or made it their home and they are excellent soloists Benny Carter probably provided the arrangements and all of the eight titles became top interpretations on which singers orient themselves to this day Music For Torching is the title of the program The tempos and the soloists are a perfect match for this title Everything combines to make a pleasant atmosphere by no means schmaltzy but emphasizing that voice. 2013 EU vinyl LP Reissue pressing on 180 gram audiophile vinyl. Weiterführende Links zu "Billie Holiday - Music For Torching With Billie Holiday LP+CD (Vinyl / LP)"
Kundenbewertungen für "Billie Holiday - Music For Torching With Billie Holiday LP+CD (Vinyl / LP)"